KIEV, Ukraine -- At an anti-corruption committee meeting today Valentyn Nalyvaichenko, former head of Ukraine’s Security Service, accused lawmaker Ihor Kononenko, of the Petro Poroshenko Bloc, of money laundering. The allegations come amid several accusations of corruption against major associates of President Petro Poroshenko and Prime Minister Arseniy Yatsenyuk. At a meeting of the Verkhovna Rada (Ukraine’s Parliament) anti-corruption committee, Nalyvaichenko revealed documents that he claims reveal Kononenko’s involvement in suspicious schemes. The documents were originally obtained by British journalist Graham Stack and published on the Business New Europe news website on Oct. 9, Nalyvaichenko said. According to the documents, between US$ 100,000 and US$ 300,000 was laundered every month through the Ukrprominvest group, which was created in 2005 by Kononenko and Poroshenko and liquidated in 2012. The Ukrprominvest group included five confectionery plants as well as Bogdan Motors Corporation, which sells foreign-made automobiles and motorcycles and manufactures motor vehicles and ships. Poroshenko still owns a stake in Bogdan Corporation. Nalyvaichenko claims the Ukrprominvest money was moved to the British Virgin Islands through offshore companies Intraco Management Ltd and Ernion before winding up in Latvian and Austrian banks. Intraco pays for business jets used by Poroshenko, Nalyvaichenko said. According to payment documents from Intraco, Dariya Kononenko, Kononenko’s daughter, received money for the services. This implies that Kononenko is a provider of VIP business jet services to Ukraine's elite, Nalyvaichenko argued. He said he had already filed a request with the Prosecutor General’s Office to launch a criminal case. Kononenko, whom analysts believe to be the most influential lawmaker in the president’s party, brushed off the accusations. He said he was not an owner or chief executive of the companies. “The origin of the documents is not known to me. Those are just transfers by payment order, they don’t bear my signature. Those are not billing documents,” Kononenko said at the committee meeting. 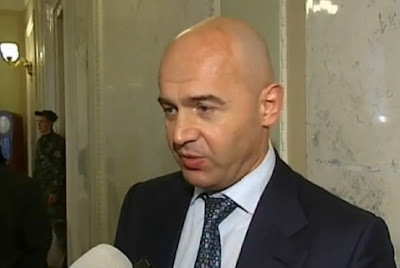 Kononenko said he had also visited a prosecutor’s office in Kiev to give his version of the case. Kononenko said it was “suspicious” for such accusations to show up before the local elections, set for Oct. 25. “[They] want to discredit me personally and our [the Petro Poroshenko Bloc’s] political force,” Kononenko added after the meeting. The Ukrainian state has struggled to combat widespread corruption and it is often cited as a key topic in the country's politics. Transparency International ranked Ukraine 142 out of 175 countries in its 2014 annual corruption survey, showing that the country's efforts to battle endemic graft are in an embryonic stage. In Ukraine, analysts claim many state jobs are underpaid, meaning some citizens make up the difference between their salaries and the cost of living through corruption. Recently the US ambassador to Ukraine Geoffrey Pyatt accused the country’s Prosecutor General’s Office of obstructing efforts to investigate its own employees and combat corruption. This site has supported me a lot in my worst times! I am really grateful to the developers of this security companies in the bay area amazing site! Five stars for them!